If I get a dollar every time when asked how to reset iCloud password… Oh, wait; I will sure become a billionaire soon! Jokes aside, resetting iCloud password has many legitimate purposes other than reusing a stolen iPhone. Sometimes the password can be extracted from different sources, but what if all known methods failed? Neatly every system allows resetting the password if it is lost or forgotten. You just need to prove that you are you, the account owner; or have a legal right to access it. Instructions are a bit confusing, but we wanted to concentrate on just a single case: if you have two-factor authentication enabled and have the passcode set. So all you have to do is just couple of clicks on the trusted iPhone, and you’ll have to enter a passcode once. What Apple does not mention is that the passcode is not always required. We cannot say for sure, but it seems that the requirement to enter the passcode here is eliminated if the iPhone has been unlocked with it (but not Touch ID or Face ID) last time, or if that feature (changing the iCloud password) has been already used. After some time, however, you will be still prompted for the passcode – is it cached, or may be the special token is created? No idea. What if you do not have an iPhone handy, but only have a Mac? It’s almost the same. Go to iCloud settings, and there you can set the new password without entering the old one. 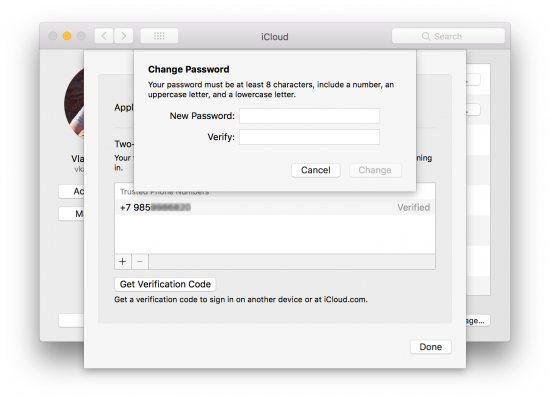 All you will be prompted for is the password you use to log in into your Mac. Is it a bug? Definitely not, it is in fact a convenience feature. But if you ask whether if creates a security risk, the answer is a reassuring “Yes”. All you need is a trusted device and the passcode (or a Mac password). Pease also note that the Mac password can be cracked (though not very easy); we have an app for that, too. What if 2FA is not enabled on the account, or passcode (or login password in a case of Mac) is not set? You will be prompted for the old password (and sometimes even forced to answer security questions). But what if we enable 2FA or set the passcode first? No, that will not work either, try yourself and see what happens. There was always just one workaround to access iCloud accounts protected with 2FA: using tokens instead of a password. We were the first who discovered it a long time ago, and it was a real breakthrough in iCloud acquisition. Apple’s response was smart: they dramatically shortened the token’s lifetime. The token extracted from the desktop still works for most types of iCloud data, including files in iCloud Drive, iCloud Media Library and synced information (contacts, call logs, calendars, notes and Safari browsing history). However, if you try to use that token to download iCloud backups the next day, you can only obtain the list of devices and backups, but downloading fails. The token extracted from the desktop is not the only one that we use. If you log on into 2FA-protected iCloud with Phone Breaker using a password, you are of course prompted for the second authentication factor as well. This could be a code send to the trusted device as a push notification, or a code generated on the device manually, or (now with the latest version) a code delivered to a trusted phone number as a text message (SMS). If the login was successful, EPB creates and saves its own token, and for all future requests to the same account make use of that token instead; this allows logging in without providing the second factor. But again, the problem is with token expiration. The solution? We have it now. And surprisingly, it uses the good old password (so the new token is generated every time), but does not require you to enter the second factor. How could that be possible? Thanks to Apple’s new authentication scheme, GSA (GrandSlam Authentication) available in iOS 9+, macOS 10.11 and later. With this, one can use SMS to receive the security code. More importantly, this makes the computer “trusted”, so it does not ask for the second factor anymore. This means that if you run Elcomsoft Phone Breaker 8.1 on the computer that is already logged into the cloud (the suspect’s computer), then all you need is a password to the account. That will be it! No push notification to the trusted devices, no SMS codes, nothing. And if you run EPB on another desktop, you will only have to provide the second factor once, and we will do the rest of the job (make the computer trusted) for you – but, in contrary to the token-based solution, no problems with expiration anymore. Of course, we will also save the password for you, so to get fresh portion of iCloud data, you only need to select the Apple ID from the list. Can we get data that makes the computer trusted and move it to another computer? Not at this time, but we are working on it. It is not as easy as copying a file; we’re still trying to figure out what exactly makes the computer “trusted”. With iOS 10+, you can easily change the iCloud password even if you don’t know the original one. This goes directly from the device (iPhone, iPad, Mac etc.) All you need is the device passcode (or Mac system password); sometimes it can even be done without the passcode. The iCloud Keychain is always stored in the cloud (not just synced across devices as would be possible without two-factor authentication). Theoretically, it is accessible by TLA. There is no further protection such as the special iCloud Security Code (as with accounts without 2FA). The second factor is not required if you run Elcomsoft Phone Breaker 8.1 on a “trusted” computer. If you do not have access to a trusted computer (the one where the given account is already being used by the system), we can make any computer trusted by passing 2FA just once. There will be no token expiration problem here; iCloud backups can be downloaded any time further. All this is definitely good news for the forensic experts. How this can affect your personal security and privacy? You decide. This entry was posted on Tuesday, November 28th, 2017 at 11:59 am	and is filed under Did you know that...?, Elcom-News, Security, Tips & Tricks. You can follow any responses to this entry through the RSS 2.0 feed. Both comments and pings are currently closed. I fail to understand how this affects my personal security. For someone to actually gain access to my account with 2fa they need to steal my computer and get my password but for any random person it is still impossible to gain access to my account. Correct me if I’m wrong. I presented it as facts but obviously it is still quesitons.